Conscientiously: Hectic is an understatement. well we thoroughly enjoyed (and continue to enjoy) our new ZipLine. and then, low an behold we started our beloved SUMMER SCHOOL! With the addition of our recent year long volunteer, Isabel, I was able to plan and implement English class for all the kids. Last year we focused on math, but this year the kids were begging for English class (even the high school kids). 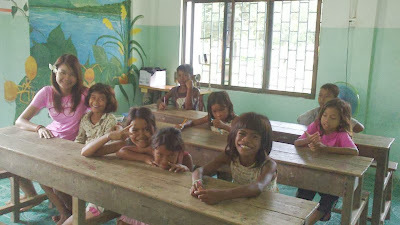 After the kids were tested, I was able to put them in to different classes depending on their level. Although our kids understand and speak English, most do not know the basics of sounding out words and reading, so with most of them we are starting from the beginning. I remember going to school for the first time at Colwich Grade School. During that first year with Sister Macrina, we did alphabet books and I LOVED doing it. I remember it distinctly, but alas only my uber saving sister, Vicki may still have hers after all these years. I wanted to do something similar here. I went to the good ole’ internet and shifted though the hundreds of educational sites looking for something similar. I found lots of fun projects, but I needed something to fit this country and culture. I mean, sure the kids will understand A is for Apple and B is for Ball, but I couldn’t find whole alphabet worksheets that had the items the kids experience here. For example, rural Cambodia does not have Canaries or Firetrucks. Nor do we have cupcakes, horses, or snow. I decided to make my own updated version that took quite a while to create (I’m up to “J”), but the books went over very well! Other classes were a bit more advanced and used English books and some are able to work at their own pace with minimal help. I also incorporated a weekly vocabulary test. I hated those when I was young, but it is such a good way to learn words. We had the words posted around Wat Opot and it was normal to hear the kids standing around debating how to spell candle or black or bear. Our two Khmer 3rd year sociology students left us after spending 2 months at Wat Opot. They were an amazing summer addition; we got the extra help and they got valuable practical working and educational experience. Dalin and Suyly taught Khmer and Math to our 4th – 7th graders. During their time with us they lived at Wat Opot, so they were around playing with the kids and we even got them on the ZipLine – something Khmer young ladies would probably not do, but anyone who knows me knows that I try to keep male/female distinction to a minimum. I want boys that cook and girls that play soccer. Gender roles are not so strong in some ways here, at least while playing. I posted in the past about the them dressing up, and just look how pretty some of the boys made their roads and houses. Perhaps one of the most exciting things for the kids is the addition of educational technology devices! I am becoming one of the biggest advocates for Leapfrog. Longtime WOCC supporter and WOCF secretary, Deb, sent us some leapfrog products; learning games and Clickstart first computer over a year ago. I kept them in storage for a long time because we just didn’t have the supervised space needed to keep the kids from misusing or accidentally destroying the expensive games. With a revision of the CLC from a play room into a learning room we were able to create an environment conducive to learning as well as keep the supplies intact. I bought more Leapfrog devices at Toys and Me in Phnom Penh – expensive yes, but I believe detrimental to what we are trying to accomplish with educating the children to the best of our ability. The Leapfrog electronic books are especially useful here because it’s just not possible to read a bedtime story to everyone and we haven’t been able to organize ‘story times’. These electronic readers not only tell the story, but by holding the ‘pen’ over any photo on the page, it makes sound, songs and the like. I'm not a huge advocate for electronic games, but these are 'educational' not only in what they teach, but the kids have to understand English to be able to play them! A double leaning experience. Another 'bonus' is that with 30+ primary age children, and only 7 electronic learning devices, they have to SHARE!!! Hope you enjoyed a small glimpse of our Summer, 2013!